Sam Meyer is one of the brilliant minds behind Cocktailians, a group blog with the goal of “restoring civilization, one ounce at a time.” With the help of Chuck Taggart and Tony Hightower, Sam details the finer points of presidential drinking games, critiques the latest in bar gadgets, provides his readers with breaking drinks industry news, and shares his secret love of White Russians. Cocktailians is a blast and has a little bit of everything, so please do click through. Onto Sam’s entry in the Hiram Walker Gingerbread Cocktail Contest, a drink he calls Can’t Catch Me. Shake and strain into a chilled cocktail glass, and garnish with candied ginger. Now, Sam wasn’t the only participant to choose Rye to work alongside Hiram Walker Gingerbread, but I will say I was quite surprised (and intrigued) by the addition of maple syrup here. For me, it’s a great fall/holiday flavor and seems like it would work really well with the hints of vanilla and cinnamon that you get from the gingerbread. Sam submitted this recipe with the disclaimer that he was “rotten at naming cocktails” but I kind of like this one. 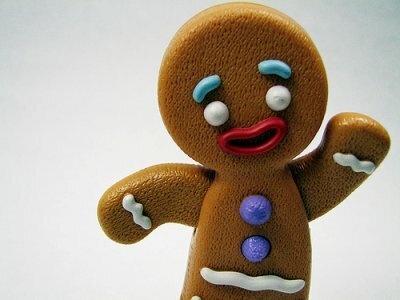 He’s the Gingerbread Man… running away…saying “Can’t Catch Me”…it’s cute. This sounds like a cocktail that’d be perfect for sipping by the fire with family and a plate of Gingerbread cookies. Nicely played, Sam!